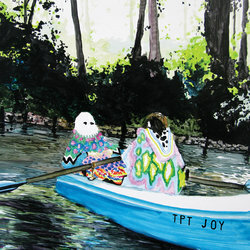 Melbourne trio The Peep Tempel will release their new LP Joy via Wing Sing on October 14. Joy follows their sophomore album Tales, that captured the attention of fans across Australia and was described as not only a near-perfect punk record, but a brutal look at contemporary suburban Australia. The album — featuring their breakthrough song 'Carol'— was critically acclaimed and shortlisted for the 2014 Australian Music Prize. Central to all The Peep Tempel releases is vivid storytelling. Characters in their songs are personified by varying vocal styles, with the band’s rhythm section and off-kilter guitar sound, creating music that pounds, lurches and staggers around creating a perfect backdrop for each vignette. The Peep Tempel explore the spectrum of human emotion on Joy, through stories, capturing songwriting and sound. With the benefit or more time in the studio, the band incorporate sounds, including: organ, piano, a spanner on steel and car engine, to add to the chaos. It is this measured indulgence, in addition to The Peep Tempel’s customary stark guitar, bass and drum arrangements, that builds the foundation of a potentially timeless album. Still littered with the band’s trademark villainy and tales of darkness, this album is a celebration. On grot-rocky ‘Rayguns’, The Peep Tempel utilise pace, screaming guitars and pointed lyrics to capture the mood of carnival and hysteria created by certain leaders and members of our community who stand to benefit from steering the disenfranchised and ill-informed down a path of intolerance, hate and fear.